July 4 approaches and The East Bay SPCA reminds pet owners to keep their pets safe on the holiday that more pets go missing than any other. If it seems tempting to take Fido along with you to the park or parade, think again. From Alameda to Vacaville, spectacular firework displays will light up the East Bay sky this week. If it seems tempting to take Fido along with you to the park or parade, think again. People should be especially sensitive to their pet’s needs during the July 4 holiday. According to HomeAgain microchips, one in three pets will go missing in their lifetime and without proper id, 90 percent will not return home. It is also true that more pets run away or go missing on July 4 than any other day of the year. On this high-risk holiday, the East Bay SPCA urges pet owners to plan ahead to prevent their pets from becoming lost, or worse. Fireworks and rowdy parties appear as early as the first of July as Alameda County residents ramp up for July 4. Oakland residents have surely heard fireworks in the last few days, and so have their pets. While humans enjoy fireworks, animals can feel quite different. The East Bay SPCA’s Chief Veterinarian Dr. Michael Sozanski says pets and fireworks do not mix. “Pets often find the loud, unpredictable noise and bright displays of light very frightening.” Dr. Sozanski recommends not taking your pet to fireworks shows, and providing them with a place to curl up and hide while at home. Keep your pets indoors. Keeping your dog and cat indoors is one of the simplest things you can do to keep him/her safe this 4th of July. Even if your pet usually does well outdoors, both cats and dogs might run from fireworks or people in a panic, unable to find their way home. July 4th is the number one day that pets go missing; make sure yours doesn’t! If possible, stay at home with your pet; never take your dog (or cat) to a fireworks display. Make sure your dog or cat is microchipped. In addition to a collar with tags, your pet should be microchipped. A microchip is the only permanent form of identification and will help you find you pet even if he/she loses a collar. A microchip is a device no bigger than a grain of rice that when scanned (by a veterinary clinic or animal shelter), will pull up owner information in a database. The East Bay SPCA offers affordable drop-in microchip services. 1. Begin your search right away. Contact all local public shelters, and file a lost animal report with them. Be as descriptive as you can about your animal so animal care staff or volunteers can identify him/her. The East Bay SPCA recommends visiting in person and asking to see the animals to be extra safe. 2. Contact your neighbors, canvas your neighborhood. Let people within close proximity of your home know where and when your pet was lost. While searching, bring along your pet’s favorite treats or a toy in case you spot him/her. Create a flier, post it around the neighborhood and hand it out to passersby. 3. Get support from friends and family. Enlist your friends and family to put up fliers, contact animal welfare organizations, and post to social media or other online sites. Some online resources for lost pets include: Pet Amber Alert, Finding Rover, Fido Finder, and Fido Alert on Facebook. Also use Craigslist, Facebook, Twitter, and other platforms to spread the word. Once your pet has been located, remember to follow up by posting the good news to let concerned friends know. The East Bay SPCA is a 501(c)3 nonprofit committed to the welfare of cats and dogs in Alameda and Contra Costa Counties that strives to eliminate animal cruelty, neglect and overpopulation by providing programs and education that support people and companion animals. One of the nation’s oldest humane organizations, the East Bay SPCA celebrates its 140th birthday this year. 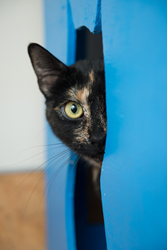 The East Bay SPCA is not affiliated with any other SPCA or Humane Society and receives no funding from the government, national or statewide organizations. We operate two adoption centers and two spay/neuter centers in Oakland and Dublin. We also offer dog training classes and humane education programs in both cities and provide a full-service veterinary clinic at our Oakland location. More information about the East Bay SPCA can be found at http://www.eastbayspca.org or by calling 510.569.0702.